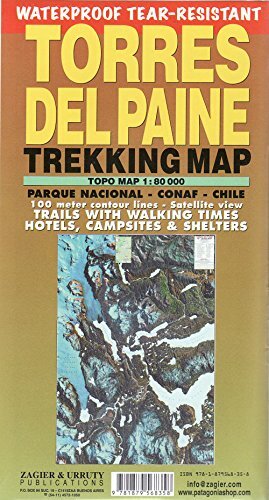 TORRES DEL PAINE WATERPROOF TEAR-RESISTANT TREKKING MAP Highly improved new 2016 edition! The biggest and more updated trekking map of the famous Park. Satellite relief, contour lines, timed trails, shelters, camping and inns. Recommended by the National Parks Administration and the National Tourist Service. Not available in Chile. El mas grande y actualizado mapa del Parque Nacional chileno que es estrella en el mundo del trekking. Relieve satelital, curvas de nivel, senderos con tiempo de marcha, refugios, campings y hosterias, etc. Respaldado por Conaf (Parques Nacionales) y el Servicio Nacional de Turismo de Chile. 2016 edition printed on tear-resistant waterproof recicled plastic paper. If you have any questions about this product by Zagier & Urruty, contact us by completing and submitting the form below. If you are looking for a specif part number, please include it with your message.